Endometrial thickness is a popular diagnostic modality that is used to determine if a woman is in reproductive age or not. If the endometrial thickness is higher than the standard limits, the risk of developing life-threatening conditions like cancer is increased. But how many layers endometrium have? 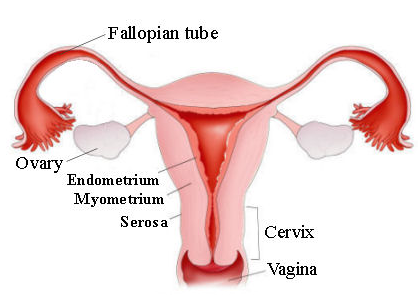 How to determine whether the endometrium is thicker than normal or not? Functional layer: It is in-line with the uterine cavity, shed during menstruation and regenerated as soon as the menstruation ends. The proliferation or growth of functional layer is caused by rising levels of estrogen (during follicular phase of the cycle). And its later changes are stimulated by progesterone. Together these two hormones control the growth of functional layer in order to provide a healthy environment for the implantation and growth of embryo. In progesterone deficiency, cells in functional layer die due to the constriction of arteries, causing menstruation. Basal layer: It is in-line with myometrium and adjacent to the functional layer. It is where the functional layer begins. This layer doesn't shed during your menstrual cycle. What Is the Normal Endometrial Thickness? In MRI, endometrial thickness can be assessed and measurements are based on the mid sagittal slice. The thickness usually depends on factors like time of measurement, age and certain medicines use, etc. In the 1st phase, both hormones - estrogen and progesterone - are at low level. It lasts for the first 5 days of the cycle (after the end of last menstrual period) and the endometrial thickness is about 1-4mm. In the 2nd phase, estrogen hormone is dominating and the thickness is approximately 4-14mm. The can last about 10 days. In the 3rd phase, progesterone level is dominating and thickness is about 14-26mm. The length of this phase is around 14 days of the ovarian cycle (in an average 28-day ovarian cycle). Maximum limit is lower than 5mm. 7% carcinoma risk if endometrium exceeds 5mm and 0.07% risk if it is below 5mm. In case of hormonal replacement therapy, 5mm is the max limit. The normal thickness is suggested to be 8-11mm. 7% carcinoma risk if endometrial thickness is above 11mm and 0.002% risk if it is below 11mm. On tamoxifen: Thickness should be less than 6mm. What If the Endometrium Becomes too Thick? The condition in which endometrial thickness exceeds the normal thickness is referred to as endometrium hyperplasia. It doesn't cause cancer but can aggravate the risk of developing malignancy. The most common sign is bleeding from the uterine cavity abnormally. It is heavier than normal bleeding during active menstruation. Period cycle of less than 3 weeks. In case of postmenopausal, if you face uterine bleeding, you must talk to your doctor immediately. A synthetic hormone, progestin can treat endometrial hyperplasia. It is usually consumed orally, taken as a vaginal lotion/cream, injected or given through an intrauterine device. Mild hyperplasia of endometrial cavity is very rarely associated with an aggravated risk of developing malignancy. In atypical hyperplasia, cancer chances are fairly high. In simple atypical hyperplasia, you have 8% chances of getting cancer. Complex atypical hyperplasia has 29% chances of developing cancer. Sometimes, uterus removal is recommended because the high cancer risk, but this means you can't have babies in the future, so before go for it give it a through consideration. Can Weight Loss Affect Your Period? What Do Brown Discharge and Cramps Mean? Can Plan B Delay Your Period?